Yes, that’s right. 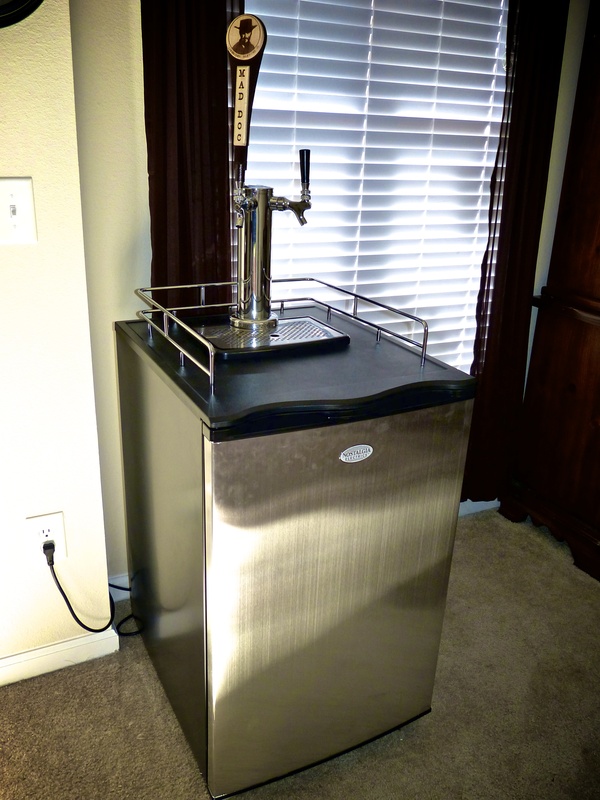 We have a kegerator now. I’m not sure if I’ve mentioned this before, but we take beer seriously around here 😉 Joseph had been talking about getting a kegerator for quite some time, and I decided, with the help of our families, to make that finally happen for him this Christmas. It’s a beauty, ain’t it? Right now we have sixtels of Sweet Josie Brown Ale and a Belgian Noir. 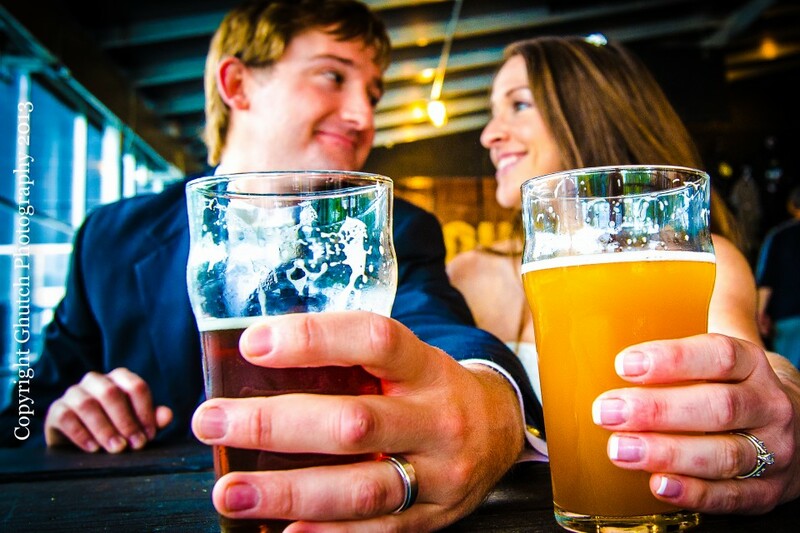 While it was Joseph’s gift, I admit it is pretty amazing that we can pour fresh beers in the comfort of our home. Several of my Christmas gifts this year were cookbooks that I had asked for, one being a book on Middle Eastern Cuisine. It’s called An Edible Mosaic and based on dinner last night, I highly recommend it. More about that in a moment. A little back story is necessary. Spoiler – the Shawarma chicken was not even close to the Musakhan chicken I was hoping for, BUT it was REALLY good. So while there was a slight tinge of disappointment, it quickly dissipated once the flavors happening in my mouth were fully realized. Can you see the kegerator in the background? This picture sums up the evening pretty darn well. Okay, now the specific dishes. Another favorite dish of mine from the Casbah is their Arabic salad. In the cookbook there was a recipe for a Middle Eastern salad. They turned out to be basically the same, which is a major “hell yes” as far as I’m concerned. It’s super easy to make too. 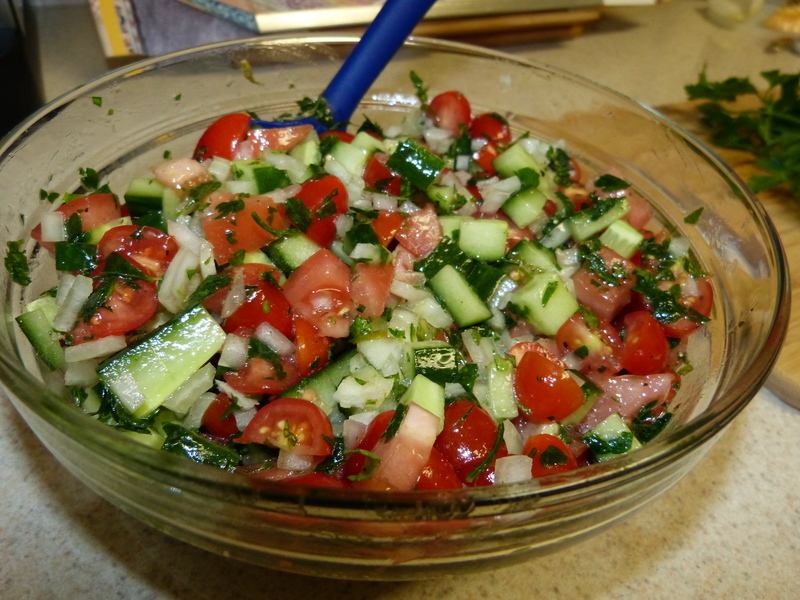 So if you like cucumber and tomato salads in general, you will really like this one. What makes it different from the traditional cucumber and tomato salad is the lemon and mint. It sounds odd, but just trust me on this. 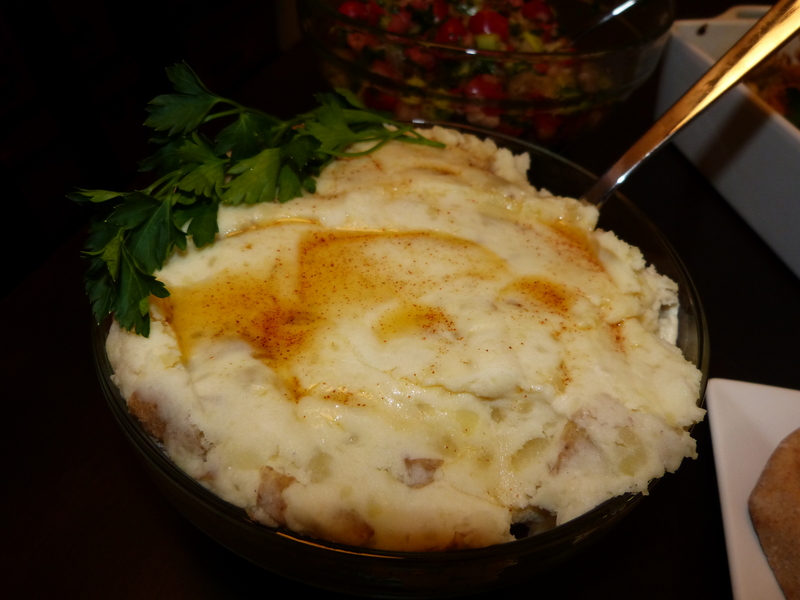 Next I made a garlicky potato dip. It was also quite good, but it was a bit on the dry side. Something to keep in mind the next time I make it. The drizzle on top is cayenne pepper and olive oil. Yum. To go with the potato dip I wanted to have the flatbreads with the thyme and sumac seasoning, buuuuuutttt I really didn’t want to make dough from scratch, let it rise, punch it down, bake it, etc. I’m a bit lazy when it comes to baking with yeast. So 🙂 I bought small whole wheat pitas. Boom. 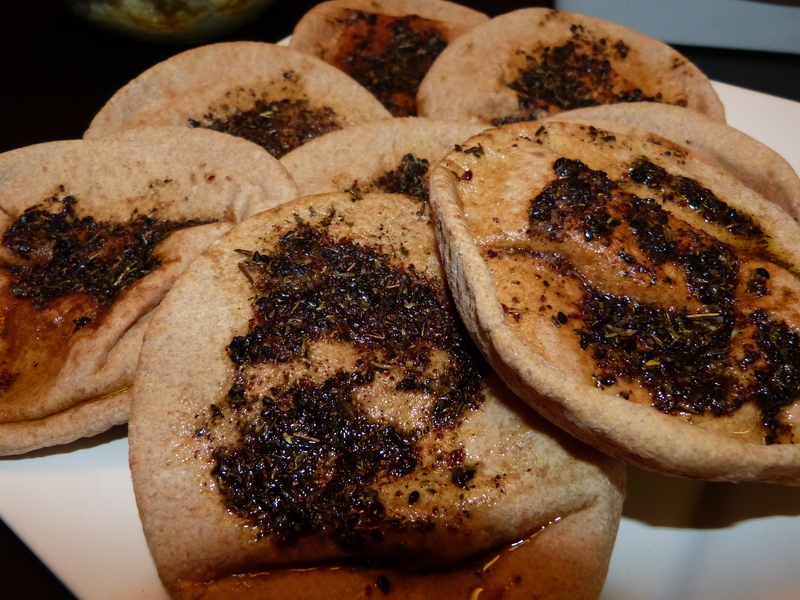 Then I made the thyme and sumac seasoning, mixed it with oil, slathered the tops of the pitas, and baked them for about 10 min. This was the crowd favorite last night. That seasoning was ridiculously tasty. I think the picture does them justice as well. Just look at them. 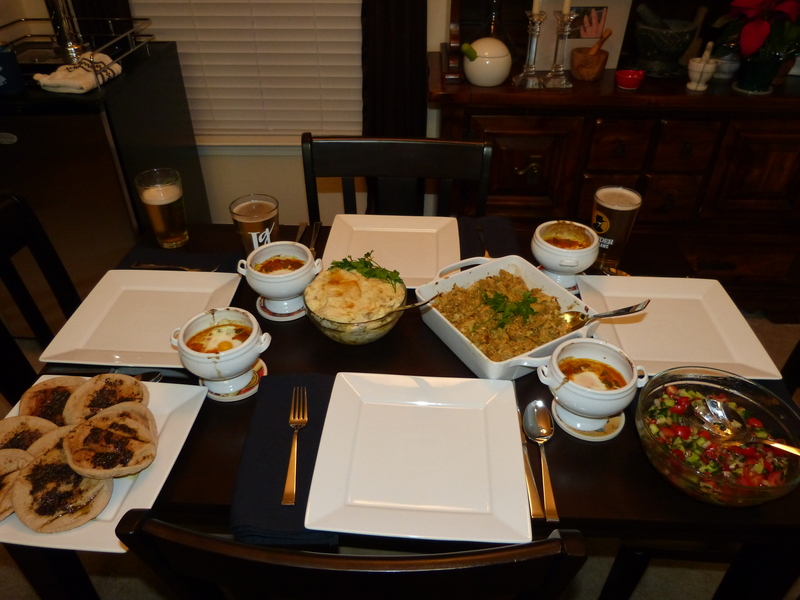 When I told our dinner guests about the next dish I made, I received a few raised eyebrows. Of course it’s reactions like this that make me think “challenge accepted.” How does egg poached in a spicy tomato sauce sound to you? If you said delicious, then you are correct. Even my eyebrow raising guests liked it, and – might I add – cleaned their bowls. 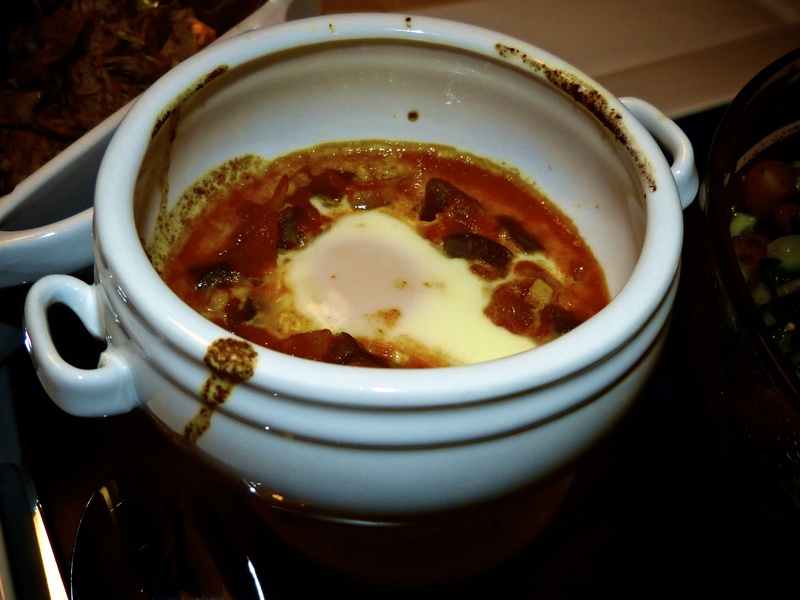 A word of warning though; it’s very easy to overcook the eggs. Or maybe it’s not and I just overcooked mine. But I’d like to think it’s the former. 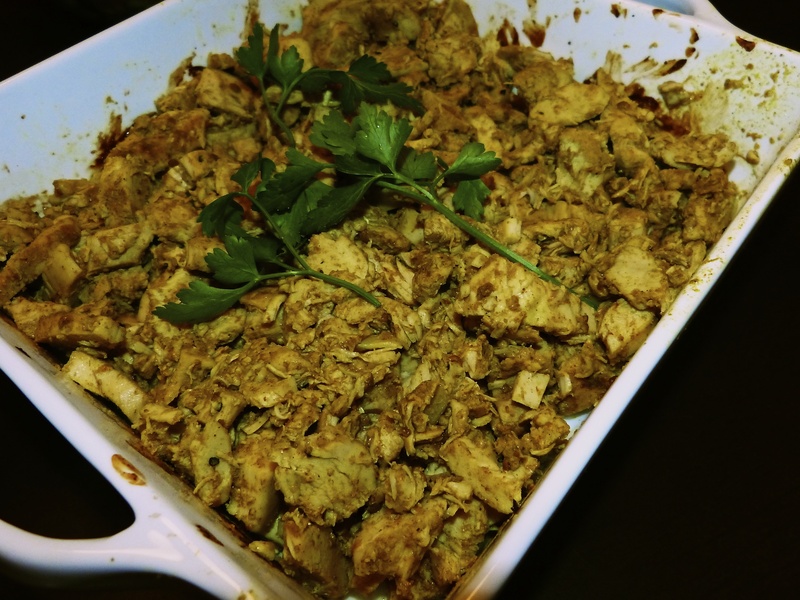 Last but not least, the Shawarma chicken. This dish required about 10 different spices to flavor the yogurt marinade for the chicken. Totally worth it. I already had all the spices on hand, but that’s due to the fact that I keep trying to perfect the Musakhan chicken recipe I adore. Moral of the story – just get all the spices. You’ll want to make more dishes like this once you try it and then you’ll already have them. It bears noting that both me and J agreed that we weren’t hungover this morning, when by all accounts of beer consumption last night we should have been. We give credit to the spices in the food. Obviously 😉 So that’s another reason to give Mideastern fare a try, right?